Ice is colder than water. Blue derives from indigo. When one's viewpoint excels that of the teacher, one is ready for transmission. If the children who are raised are not equal to their parents, the family will decline in a single generation. Tell: Who is the one who snatches up the father's function? Deshan came down to the hall carrying his bowls. Xuefeng asked him, "Old Master, the bell has not yet rung nor the drum sounded. Where are you going with your bowls?" Deshan immediately went back to his room. Xuefeng told this to Yantou. 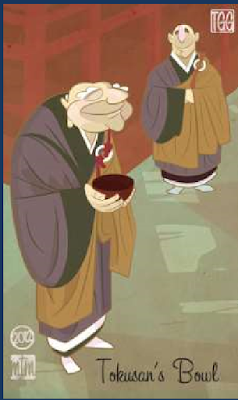 Hearing of this, Deshan sent his attendant to summon Yantou and then asked him, "Don't you approve of this old monk?" Yantou secretly whispered his intention. Sure enough, the next day, when Deshan ascended the rostrum, his talk was quite different from usual. Yantou went to the front of the Zen hall and rubbing his hands together, laughed loudly and said, "Wonderful! How happy I am that our Old Man has realized the last word. From now on he'll be subject to no one on earth." As for the last word, neither Yantou nor Deshan have ever heard it, even in a dream. When I examine this point, I find they are just like puppets on a shelf. You will realize the last word. The last word: understood or not? The last word -- understand? No? Deshan, father and sons, are exceedingly abstruse. Deshan the father and his sons are exceedingly indistinct. Within the group there's a guest from Konan. Don't sing the partridge's song before men. Don't sing of the partridges in front of people. If you accept unrealities and take in echoes, you miss Deshan. If you suppress the strong and help the weak, you bury Yantou. I tell you frankly, for an example of the proverb, "When the teacher is excellent, the apprentices are strong," credit goes to Deshan and his disciples Xuefeng and Yantou. Those who conceal an army to fight by night do not see Deshan. Those who attack occupied territory by day can hardly know Yantou. What they don't realize is that the battle commander picks fights by day, the watch commander patrols the camp by night. Deshan just accepts the flow, being as is. Yantou and Xuefeng scatter rubbish in the eye; playing at being adept, they turn out inept. One might expect Deshan to say, as head of the temple, "The meal is late. You know our schedule is tight. When we have to wait for the meal, that means the time for the monks to rest is shortened, and they need their rest. So it's important that we have our meals on time." But he said no such thing. He just turned and went back to his room. This is the first noteworthy point of the case. As he turned around and headed back, he gave a silent teaching. Then Yantou brings up "the last word." What is the last word? When Deshan asked Yantou about this, Yantou "whispered his intention." What about Yantou's whisper? Can you fathom it? Suppose you were in the assembly the next day when Yantou exclaims "From now on, no one under heaven can outdo him!" How would you answer Yantou's implicit challenge. Part of the function of the koan's structure is to arouse doubt in the mind of the onlooker, in order to examine the doubt, the doubter, and the doubting. Some say Yantou was provoking an incident in order to help Xuefeng wake up. The "first word" and "last word" refer to samsara and nirvana, or the relative and the absolute, or responsibility and freedom. A genuine understanding of either implies an understanding of both. Later, when the two were traveling, Yantou would say to Xuefeng, "What comes in by the front door is not the treasure of the house." This in its way is a key to this koan. Picture Deshan with his bowl, Xuefeng challenging him, and Deshan turning back to his room. What is Xuefeng up to? Is he just being egoistic and rude? Is he thoughtless, or is he challenging Deshan, "Hey, show me your Zen"? What was in Deshan's mind when he returned to his room? Would he have controlled resentful thoughts, kept his mind aloof, and have refused to be moved by Xuefeng? Or would he have flowed out love and compassion toward Xuefeng, hoping in this way to help him overcome his ignorance? What would you have done? No one walked back to Deshan's room. Who, or what, is this no one? Then, in the second act, Xuefeng tells Yantou what happened. Was he bragging, saying the he caught the old man out? Yantou seems to think so and comments that Deshan doesn't know the last word. Why does Yantou side with Xuefeng? What is the last word of Zen? How is it that a renowned teacher such as Deshan does not know it? We have lost the real word, the live word, and so live in a twilight world. Words bring worlds into being -- so what brings words into being? How could we name that? One must say the last word without opening the mouth, and to know this word one must have already gone beyond anything. Then in the final act Deshan gives a talk like no other, and Yantou declares that he has truly grasped the last word of Zen. What was the talk that so pleased Yantou? Did Deshan give a talk? The last word. There are four wisdoms: Great Perfect Mirror Wisdom, Universal Nature Wisdom, Marvelous Observing Wisdom, and Perfecting of Action Wisdom. When you first attain realization, the first, Great Perfect Mirror Wisdom, appears. This is the fundamental wisdom. Usually, however, this wisdom is still dim. As you make progress, polishing the other three wisdoms, this Great Perfect Mirror Wisdom becomes ever more brilliant. That final state of great brilliance is the ultimate fulfillment of subtle enlightenment. Of course, it scarcely needs to be said that these wisdoms are simply names for aspects of actual experience. There are gradations in the development of these wisdoms, from which comes the idea of first and last. Deshan should have waited for the signal before entering the dining room. Thus, the old master "got the goat" of the cook. The cook should have considered his own rule-breaking -- delaying the dinner -- before criticizing his teacher. Because his Zen was green, he was not master of his mind; he could not see both sides of the wrong. Xuefeng told Yantou about this. Xuefeng still thought he was right and the master was wrong. If Yantou had blamed Xuefeng he would have had to have heard a noisy argument, so he switched the blame to the master. 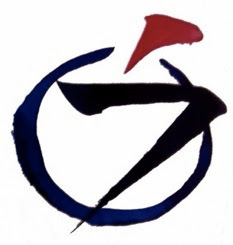 The aim of Zen is to attain peacefulness, not to settle a matter of right or wrong. Deshan hears about, calls in Yantou, who whispered to his teacher that what he had said was in hopes of enlightening his brother monk. Deshan said nothing. You see how gently the master listened to the tale-teller, and how naturally he asked Yantou about it, and how easily and freely he listened to the whisperer, just nodding to him. The next day, Deshan gave an entirely different kind of talk. What kind of lecture do you think the master gave? To work on this koan you must watch your step minute after minute. In your home, in your community, and in your world, you must polish and practice your own Zen. Do not blame the law-breakers until you examine yourself as to whether you are a law-breaker or not. If you know that there is no ego to be supported, you can easily and gracefully give in. Most of the time you gain by giving in, and you lose by persisting. There is no such thing called "ultimate truth" outside your everyday life. Deshan was a great and most capable Zen Master. Why did he quite naively turn back to his room without saying a word? Here we have to enter into Deshan's heart. Granting that he committed a blunder by coming down to the dining room before the mealtime was announced, there has to be his Zen at work here, worthy of a great Zen Master. There is no stink of Zen. He lives with no pretension, no affectation. His transcendental purity is like that of an infant. Listening to Xuefeng's report, Yantou felt sorry for Xuefeng, who did not realize his inability to appreciate Deshan's Zen at work. He attempted to inspire his good friend. He resorted to extreme measures, saying Deshan had not yet grasped the last word of Zen. Yantou was well aware that old Deshan was a truly accomplished Master. The koan here gets very intricate. For Xuefeng and the rest of the monks at Deshan's monastery, "The last word of Zen" now stands in front of them as a barrier they must break through. The great question here for everybody is whether the world-famous old Deshan had not in fact grasped the last word of Zen. Consequently, another question is "What is this last word of Zen?" Also it has to be asked whether there is really a so-called last word in Zen or not. What was the secret Yantou whispered? With this question Zen deprives a student not only of all his knowledge and intellect but even of the last smack of Zen. It will open up for him a true Zen vista, pure, lucid, immaculate and simple. Yantou ran a grand play, carrying around "the last word of Zen" until the end and demanding that Xuefeng and the rest of the monks break through this barrier. How will you respond to Yantou's call? How will you express appreciation for his efforts in producing such a grand play? If you are unable to greet him properly you have missed the point of the koan altogether. Here your concrete grasp of the koan based on your own training and experience is required. Deshan said nothing and quietly returned to his room. What a splendid state of mind! Deshan was not aware of it himself, but he had matured wonderfully with age. Can you appreciate it? Xuefeng was not able to. Here was Deshan unconsciously showing him the supreme world of Zen by his action. Similarly, Mahakashyapa realized what Shakyamuni really meant when he twirled a flower in front of the assembled monks. The last word. Literally, the last word would seem to mean the highest state of consciousness in Zen. Yantou's device was to prod Xuefeng, who was lingering along the way, by making him wonder whether there might be a last word. What is it? He must strive to achieve it in deeper realization. The last word is that which is spoken without using lips and tongue. It has no meaning. It is nothing. Yantou's exclamation after Deshan's "different" talk. Yantou was still trying to incite Xuefeng to deeper realization, but in spite of all these efforts, Xuefeng was not able to attain it at that time. It was some years later that Xuefeng finally came to great enlightenment under Yantou's guidance. In his youth as a teacher, Deshan was renowned for being quick with a heavy stick -- yet here he just returns to his room without saying a word. Why is that? Yantou brings up the idea of a "last word." What is the last word of Zen? Do you ever reach the last word? If you say the last word, I can say something else -- and that becomes the last word. Of course, the last word may not be a word at all! Deshan calls for Yantou, who whispers his intention. What did he whisper and why was Deshan satisfied? Deshan's next talk is different. What was different about this talk? So the last word, is it understood or not? If you understand it, what do you understand? If you see clearly into it, there's nothing to understand, and no one to understand it. But if you don't understand it, you're only half a person. Paraphrasing Deshan himself from earlier in his career: If you say you understand it, I give you thirty blows. If you say you don't, I give you thirty blows. So what is it? No trace of those lofty heights. Emptiness is taught for the stuck and staid. A toothless tiger yawns on the high seat. the first word (and the last). At last becomes himself the Diamond.